Mesa Falls Scenic Byway (Hwy 47) is a 28 mile route through fields and pine woodland of the Targhee National Forest, starting and ending with junctions along US 20, the main route from Idaho Falls to the West Yellowstone entrance of Yellowstone National Park. 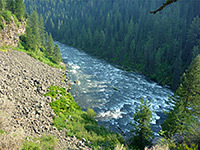 Along the way are several picnic areas and forest tracks, but the highlights are two powerful waterfalls along Henrys Fork of the Snake River - Upper and Lower Mesa Falls, of which the former is visible only from a rather distant overlook, but the latter forms the centerpiece of a developed tourist attraction and may be viewed close up from several short trails. The river flows through a large, steep-walled volcanic canyon, over 1,000 feet deep in some places, and it carries a considerable amount of water even though the drainage is not directly fed by snowmelt from mountain streams; most water originates 45 miles upstream at Big Springs. 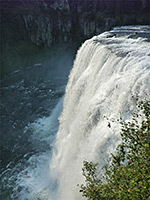 The river flows over the 110 foot Upper Falls and 85 foot Lower Falls creating a great amount of noise and spray; spectacular sights even in late summer of the water levels are at their lowest. 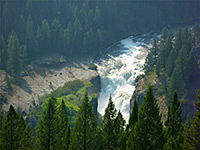 Lower Mesa Falls are viewed from a pull-out on the west side of the highway (Grandview Overlook), visible through gaps in the trees, 500 feet below. The falls consist of one main drop close to several smaller cascades and would look very spectacular close-up, from a path that descends the canyon walls to the river's edge, but this part of the gorge its privately owned so the path is out of bounds. Not so many people stop here, in contrast to the busy Upper Falls which has enough parking for several hundred vehicles. 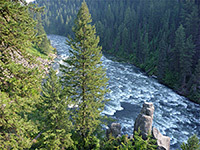 From a cluster of buildings including a gift shop and the historic Mesa Falls Lodge, a paved path descends to a viewpoint right on the brink of the 200 foot-wide falls, and another path follow the canyon up and down a short distance, giving unobscured views of the falls and the fast-flowing river below. Entrance to the viewpoint is $5 per vehicle.